1. Simple rinse clean via the tap or hose* Reduce the risk of injury from slips and falls when walk on ice, snow, mud and wet grass or other poor conditions. 2. Thermoplastic elastomer with excellent elastic & high density manganese steel to ensure the maximum durability. 3. Securely attached to your footwear & these slip-on spikes can dig into all types of terrain - ice, packed snow, wet rocks, concrete, and scree. 4. Easy on/off to fit boots, sneakers, casual and dress shoes-- Wrap the front around your toe section, then stretch the back around your heel. 5. Perfect solution for your winter worries, solve the problem of how to stay on your feet on ice and snow. STAINLESS STEEL OF QUALITY - 8 stainless-steel teeth with welding technology. High strength steel spike and chain system provide excellent traction on a variety of surfaces. Strategic placement of spikes ensures equal weight distribution for long-lasting comfort and durability. 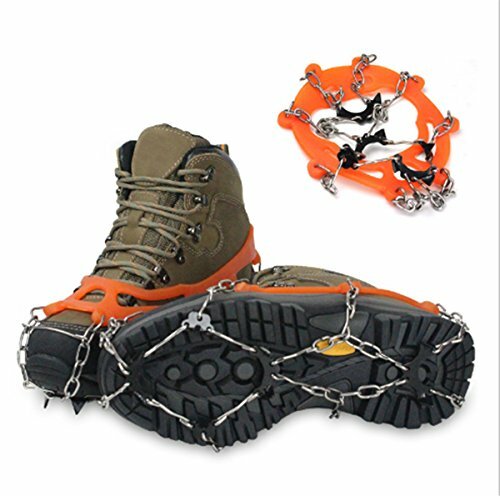 MORE SAFE AND DURABLE - The link of this snow traction cleats use welding chain and More stronger stainless steel chain. These Mountaineering Crampons would provide 360 degrees of traction on cold surfaces for all-direction stability. EASY TO WEAR AND WALK WITH CONFIDENCE: High quality Plastic Elastomer (TPE) provides a flexible, lightweight, all-day traction solution.They fit easily and securely over your own shoes or boots that make you walking confidently on any condition. MULTIPLE USES - Not only for Outdoor Ice and Snow, but also for daily use during snowy weather, especially for the elders and kids. Reduce the risk of injury from slips or falls when walking on Ice, Snow, Mud and Wet Grass or Other Poor Conditions.These slip on spikes dig into all types of terrain-ice, snow, wet rocks, concrete, and scree. Extremely durable, they attach securely to your footwear and require no special buckles or straps.